It’s the third time lucky for me making croissant. Well, sort of. I think my third time yielded decent croissants but they are still far from what I want to achieve. I’m now on the mission to practice making croissants every week until I can make them with my eyes closed (you know, not literally with the eyes closed). S is quite pleased to learn this, as well as our neighbors who are more than happy to be guinea pigs. I have learnt one thing or two every time I made croissants. Or something would emerge that I had to make note what not to do next time. First time, I used recipe from Michel Roux’s Pastry cookbook. I was extremely new to bread making back then and had little idea on what dough characteristics I should be looking for. I also trusted the recipe wholeheartedly. Why shouldn’t I? It’s Michel Roux, the great French chef. Plus, recipes from his cookbooks provide great results. Umm, but not the croissant. The recipe has very low hydration (percentage of liquid to flour in the recipe) which makes too stiff a dough to work with. It was almost impossible to roll the dough and laminating butter. It was a disaster that I was put off making croissants for a long while. My second attempt was better but there was still minor disaster happened. I used the recipe from Bourke Street Bakery cookbook. All went fine, kneading, laminating and all, until the final proofing (where you rest the shaped croissants to rise). Because the bake was done on the cold day, I had to create the warm environment for final proofing. So, I was naively put bowl of boiling water next to the croissant tray. As you would imagine, the butter leaked and melted from layers and layers of dough lamination. Umm, another lesson learnt. 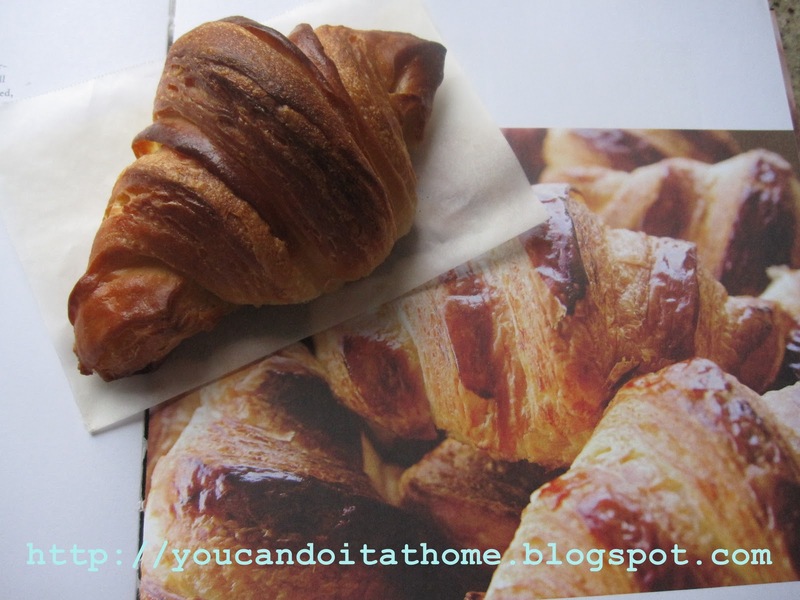 Couple of months ago, I was back onto making croissants again and using Michel Roux’s recipe again. This time, I was more experienced working with bread dough. So, I knew from the texture of the dough that it was not going to work. The dough was too stiff. I checked the recipe and finally realized that the hydration is only 50%. No wonder that the recipe yielded dough that was too stiff and impossible to roll and be laminated. So, I decided to abandon the croissant and turn it into (sort of) brioche (I find that it is difficult to throw away food). It wasn’t great brioche but still tasty nonetheless. That should have been my third time making croissants, but it didn’t eventuate. So, here comes the third time lucky making croissant. I also used the recipe from Bourke Street Bakery cookbook. Original recipe has 58% hydration which is slightly stiff to roll so I adjusted it to 60% hydration (I added more milk during the kneading when I felt that the dough was too stiff). Overall, everything went fine, only some minor issues. The past weekend just happened to be a warm weekend (of all the mild summer we had, why did I choose to make croissant on the hottest weekend in the past six weeks? I will never know). The temperature was around 30c. Which make laminating dough with butter impossible (well, butter would melt, and the croissant will end up not flaky as it should be). I had to laminate the dough at night when the temperature was only down to 27C and let the laminated dough rest in the fridge overnight. 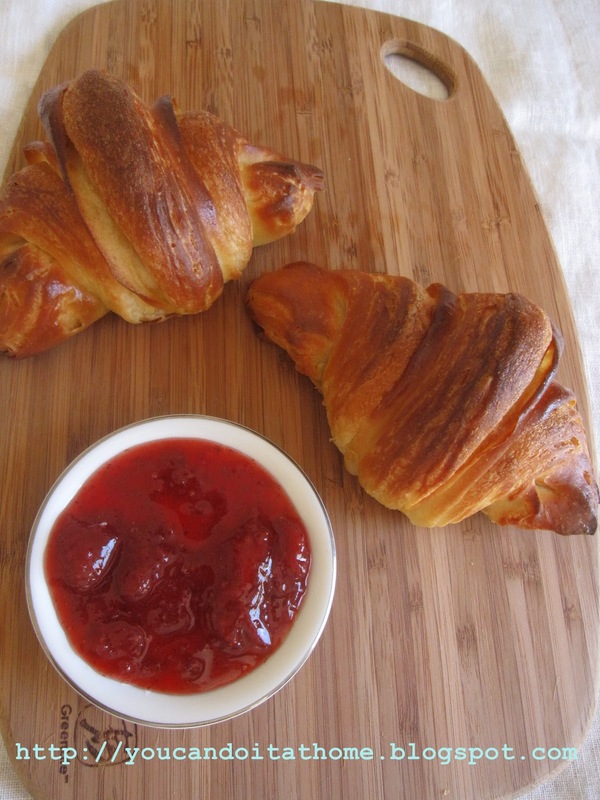 This, I believe, contributed in a bread-like texture of the croissant and not-so-flaky texture I would love to see. It was more of the Mojito time than croissant making time! Croissant will have to wait! I also had to bake and do the final shaping first thing the next morning when the temperature is around 29C in the kitchen. I had to improvise and proof the croissants in the coldest area in the house, bathroom, where temperature was around 25C. And it only took 1 ½ hours for final proof. Improvised the proofing location to bathroom, the coldest part of the house. All in all, the croissants went well. Anything baked fresh from oven would taste great. 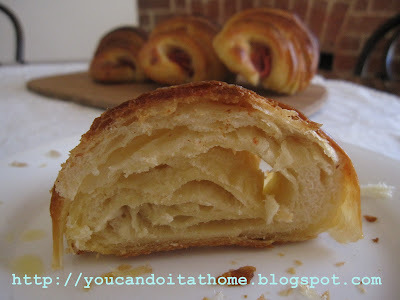 And it is even more so for fresh warm buttery croissant pulled out of your own oven. Umm, the fruits of my own labor. 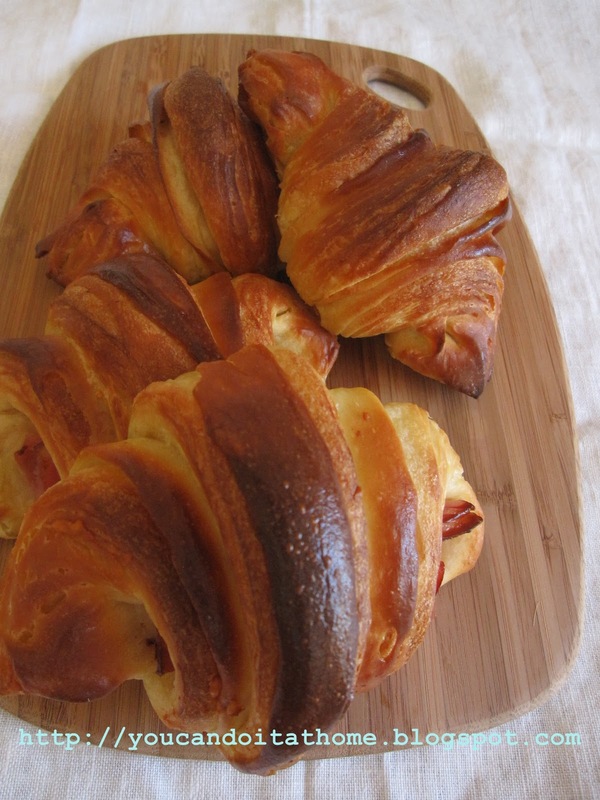 I also made half of the recipe into pain au jambon (ham and cheese croissant). I came across this Pain au Jambon idea from Tartine Bakery's. 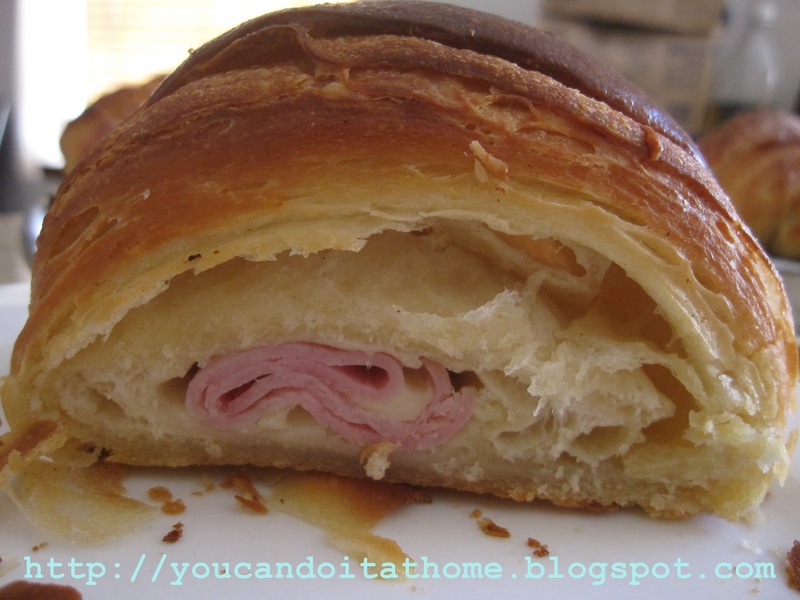 It is an unusual and interesting way to make ham and cheese croissant. Ham and cheese are rolled inside the croissant (note: I didn't really see the recipe or how this is done at Tartine but I saw the photo of finished Pain au Jambon and I figured it could have been done this way). This croissant tasted very nice. Ham and cheese penetrated flavor into the baked croissant and made them very tasty, rich and moist. The brief recipe and photos of pain au jambon is at the end of the post. To make the pre-ferment, mix all ingredients together in a bowl until it becomes a ball. Knead it for about 10 minutes until becomes elastic and smooth. 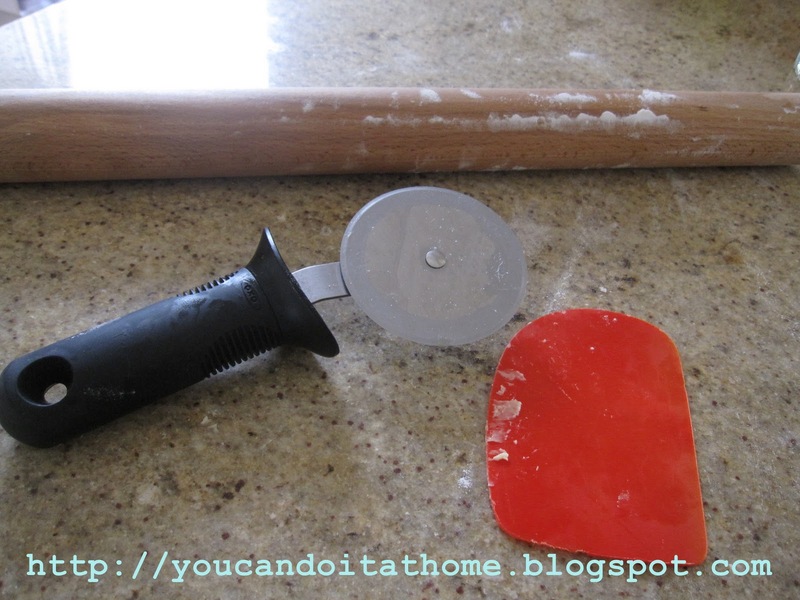 If using electric mixer, using dough hook and mix on low speed for 3 minutes. Put the pre-ferment in a bowl covered with plastic bag and leave at room temperature for 2 hours to ferment. After, store the pre-ferment in the fridge overnight (this can be kept for few days in the fridge). To mix the final dough, divide the pre-ferment into 8-10 small pieces, mix it together with all other ingredients, except butter, in a mixing bowl until a dough ball is formed. Transfer the dough ball to a bench and knead for 10 - 15 minutes (by hand) until the dough become smooth and elastic, and doesn't tear when streched gently. If using electric mixer, using dough hook, mix on low speed for 3 -4 minutes, followed by high speed for another 2 minutes. Put the dough in a bowl covered with plastic bag or cling wrap and refridgerate for at least 2 hours or overnight. Before starting the dough laminating (i.e. 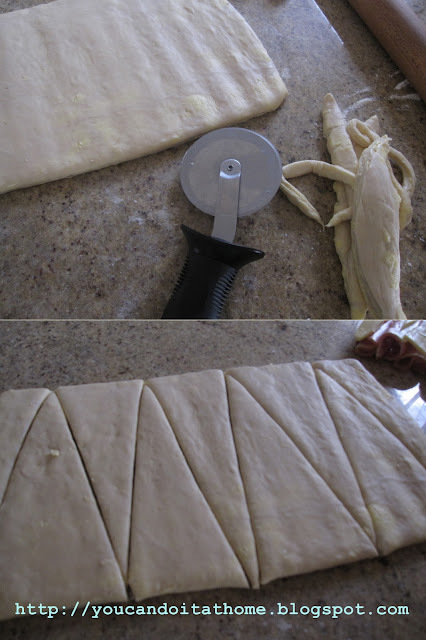 incorporating butter into the dough) remove the butter from the fridge. 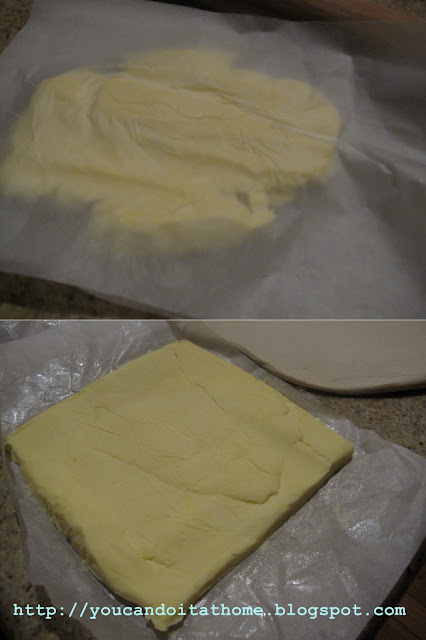 Pound the butter with rolling pin between two sheets of baking paper into 15-cm flat square. If the butter becomes too soft, store it in the fridge for 15 minutes before using. Take the croissant dough out of the fridge, using a ligthly floured rolling pin, roll the dough out into a retangle about 15 x 30 cm. Place the butter in the centre of the dough and fold th dough over the top. Seal the edges of the dough together to ensure the butter is completely enclosed in the dough. Gently and carefully roll the dough out into a rectangle, about 20 x 50 cm (approximately 3 times longer than the piece you started with). Mentally divide the rectangle into three equal sections, top, middle and bottom. Fold the top section over the middle, and fold the bottom to the middle, like folding a letter. 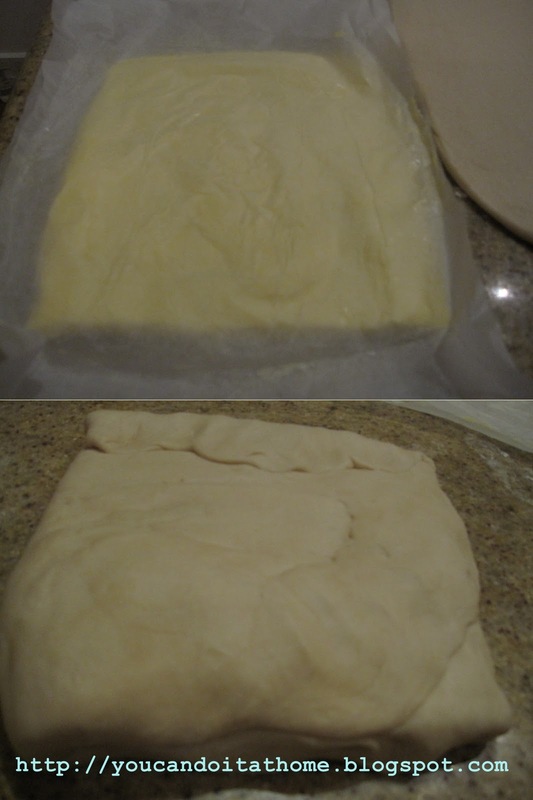 Take the laminated dough out of the fridge and roll it out into a rectangle about 25 x 50 cm with 5 -8 mm thick. Take the chilled triangles out of the fridge and shape into croissants. Gently pull the tip of triangle to make the triangle longer. Make 1-cm incision at the base of triangle. Pull away two corners at the base and roll it towards the tip. Make sure that the tip is tucked underneath the croissant. Gently brings two corners towards each other to create a crescent shape. Note: Shaped croissants can be retarded in the fridge overnight and bake the next day. Take them out of the fridge next day and follow the proofing and baking steps as below. Brush the surface lightly with egg-wash. Cover the tray with tea towel. 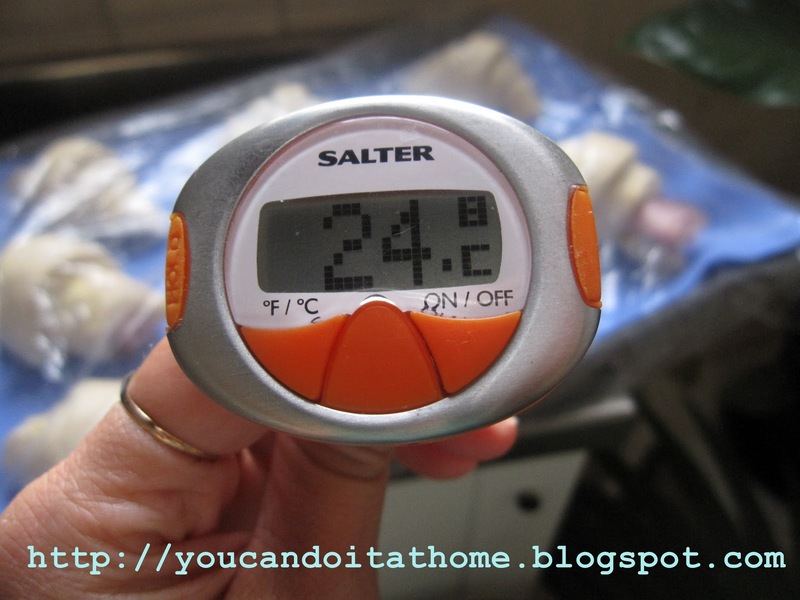 Let it stand at warm room temperature (25 c -27 c) for 2 hours until it almost double in size. Note: Croissants are proofed and ready for the bake when the layers become visible and the croissant are very soft and wobbly. There are lots of room for improvement. Follow the instructions making croissant as above. 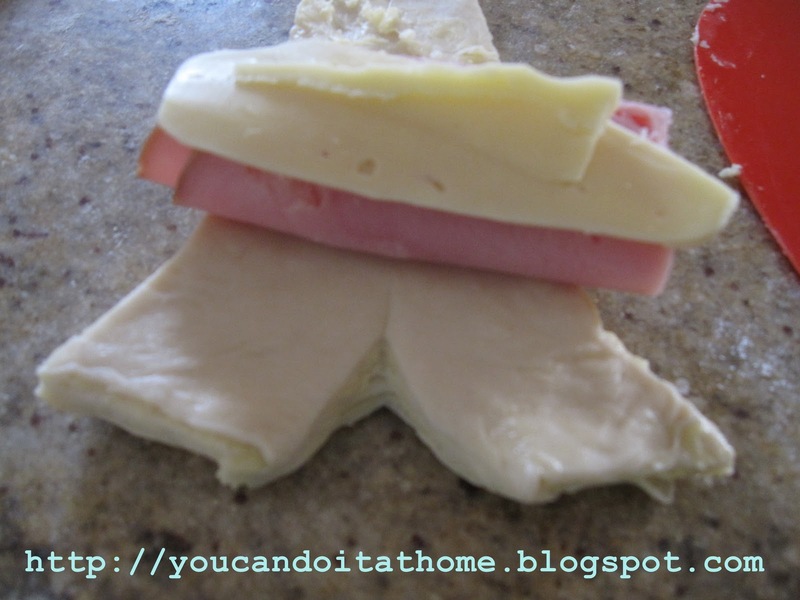 After cutting the dough into triangle, place a rolled-piece of ham and cheese at the base of triangle. Roll the dough and following instructions as above for shaping, final proofing and baking. 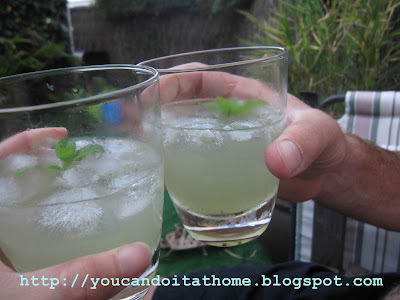 What a relief it has been to find your blog entry! I tried Michel Roux's recipe twice with disastrous and extremely discouraging results. And I've made yeasted doughs before. I totally agree that the recipe results in super dry dough that is near to impossible to work with. Cannot figure out how to adjust it! I ended up having success with Julia Child's croissant dough, but would still love to master M. Roux's recipe, as the pains au chocolat was the reason I bought the book! I understand that confusion too well. I thought before that croissant ( and puff pastry) were too hard to tackle from that experience. Roux recipe might be fit for commercial production where there is laminating machine. I think if you increase the amount of liquid by 7 to 10 percent, it will help. Cherry Ripe Macarons - one tasty little morsel! Macaron Day - Jour du Macaron = Happy Day!